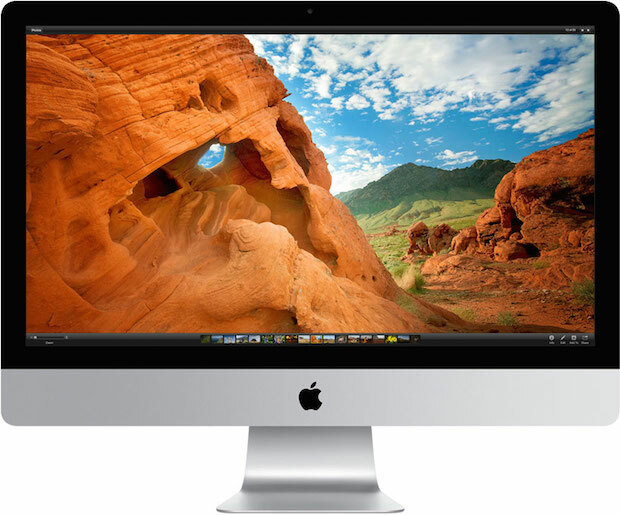 Retina Display iMac Expected to Launch This Fall? Two consistently reliable sources of Apple rumors say the company will debut new iMac computers featuring Retina displays this year. First reported by 9to5mac, Apple is said to be in “late testing” stages for the revamped iMac line, with the machines featuring new internal components, faster processors, improved Wi-Fi capabilities, and of course, the ultra-high resolution Retina display. 9to5mac suggests the new Retina iMac could debut alongside OS X Yosemite sometime in the fall. OS X Yosemite is widely rumored to launch to the public in the coming weeks, suggesting a launch of the new iMacs may be sooner than later. 9to5mac also reports that iMovie and Final Cut Pro will be simultaneously updated to support the editing of ultra-high resolution 4k footage. The precise screen resolution of a Retina iMac is not yet known, though 9to5mac offers three possibilities based upon references found within OS X Yosemite, those resolutions are 6400 x 3600, 5760 × 3240, and 4096 × 2304. For reference, a 5760×3240 display would be roughly double the current 27″ iMac screen resolution of 2560×1440. Though one should temper their expectations and consider this a rumor, it’s well worth noting that both 9to5mac and Re/Code are routinely reliable sources of Apple information. You’d need a pretty serious video card to support that resolution and not suffer any performance loss… this could be pretty exciting. I’m looking at upgrading my Mac in the coming months, will wait to see what the new iMac update is like. Considering the Retina MacBook 15″ as well. Since when is 5760×3240 “exactly twice” 2560 X1440? Is this the new math? I work out the ‘exactly twice” to be 5120X2880. The resolutions found inside OSX Yosemite do not seem to fix as an exact integer multiple of any of the existing resolutions on the 27″ iMac, or for the 20″ iMac for that matter. I think it would be much safer to assume that the lowest resolution (4096 X2340) found within OSX Yosemite would be the resolution of the 20″ iMac, and the top resolution (6400X3600) would be the resolution of the highest configured 27″ iMac. The in between resolution would be either either the base resolution of the 27″ iMac (in which all 20″ iMacs would be at 4096X2340), or a build to order 20″ iMac, in which case all 27″ iMacs would be at 6400 X3600 resolution. Either case would make for some pretty spectacular displays. As well, any of these resolutions would put a huge load on the graphics subsystem, making the use of dedicated graphics ICs necessary. Intel has done some good things with Iris, and HD5000 integrated graphics, but I don’t think they are good enough to run displays of this resolution properly. Whoops, meant roughly twice, thanks for catching that! The last time that Apple made a 20″ iMac was 2009. Did you really mean to refer to a 20″ iMac multiple times? I pray to god you are right! I was planning on buying a Mac Pro for 4K video production but I love the iMac form factor so these machines would be of great interest to me personally. It will be interesting to see what the video cards are powering these potential machines. That’s a great news indeed, but what’s about using that Imac in real & usual situation, like reading mails, txt, Web… ? i mean in term’s of resolution ? For sure, video, Photos it can be Awesome, but 5K or even 4K for read/write ? For regular use like reading and writing, a retina display means incredibly crisp text and, at least in theory, less eye strain. These are great displays for everyone, really. Thank you for your comment’s, well done so ! Any rumors of a retina MacBook Air? That will be interesting. Getting the graphics horsepower to make a good performing retina display in a very small form factor unit like the MacBook Air is going to require some very sharp engineering. Apple could do it by relying on the integrated Intel graphics, but the performance may not be the best. Does this mean they are going to update the Thunderbolt display as well? Probably at some point, Apple will have a 4-5-6K Thunderbolt display. They don’t seem to make updating their stand alone displays a priority. Actually, those resolutions amount to about 4 times the number of pixels as the ‘current’ macs. So, isn’t that 4 times the resolution, not twice? There has been a while since I saw this wallpaper on the mac picture you chose to illustrate this article. Does someone know where it can be found ?